Album of 58 albumen prints, the majority hand-coloured. 1880s-90s. Each approximately 8 x 10¼in. (20.3 x 26cm.) or the reverse. 44 with title and number in the negative. Black half leather, gilt. With one loose albumen print. See: Philipp et al, Felice Beato in Japan, p. 191; Worswick, Japan: Photographs 1854-1905, p.59. Includes five scenes depicting the devastation following the Aiki Earthquake, which struck the Aichi and Gifu prefectures in 1891. 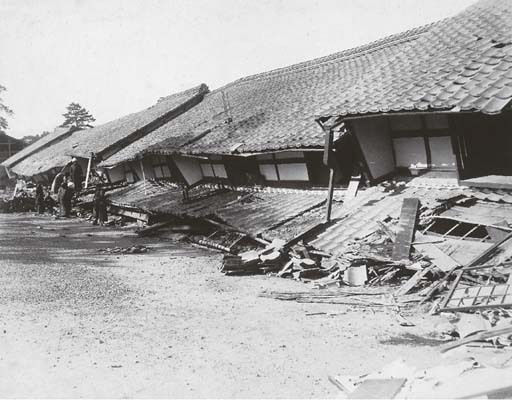 It was the worst natural disaster of the Meiji era and was also one of the first to be documented photographically.